300년 전에 지어진 이 매력적인 호텔은 메인 플라자, 플라자 드 아르마스, 현지 야간 엔터테인먼트 지역에서 150m 거리에 있습니다. 숙소에서는 무료 Wi-Fi가 제공됩니다. Hotel Royal Inka I의 객실은 클래식한 장식으로 꾸며져 있으며, TV를 갖추고 있습니다. Capac restaurant에서 세계 각국의 다채로운 요리를 맛본 후, Miski Bar에서 칵테일을 즐겨 보십시오. Royal Inka에서 5km 거리에는 알레한드로 벨라스코 아스테테 국제공항이 있습니다. 체크인 시 숙박 요금 총액을 결제해야 합니다. 현지 세법에 따라, 페루 시민과 페루에서 60일 이상 체류하는 외국인은 18%의 추가 요금을 지불하셔야 합니다. 18%의 추가 요금(IVA)을 면제받으려면 여권 및 입국 신고서 사본을 제시하셔야 합니다. 두 가지 서류를 모두 제시하는 경우에만 추가 요금이 면제됩니다. 두 가지 서류를 모두 제시하지 않을 경우 추가 요금이 부과됩니다. 인쇄된 청구서를 요청하는 외국인 비즈니스 여행객에게도 페루 체류 기간에 관계없이 18%의 추가 요금이 부과됩니다. 이 요금은 총 예약 요금에 자동으로 합산되지 않습니다. Location was great,, rooms large and quiet. Lovely front desk staff, and a great location. Was only a few minutes walk from central plaza, which meant a bit quieter. Hotel had drivers which were well priced, and very lovely. Highly recommend. Very nice. Staff very helpful Rooms nice and large. Great location. We were satisfied with our stay here. Staffs/receptionists were very accommodating. This hotel offers good breakfast and coca tea which helps us a little bit when we had altitude sickness. I recommend this hotel. It lies within the center of Cuzco. The staff was very helpful, rooms very comfortable, food in the restaurant was very tasty. Pleasant & conveniently located in the heart of the city. Near attractions. Helpful staff who offer coca tea on arrival to help acclimatization. On check in we were offered some coca tea which was a nice touch. The porter was very helpful and spoke some English, giving us some tips on where to do our washing. The hotel is nicely furnished with a large,open foyer area. Rooms are also very clean and comfortable. A nice touch are the plants scattered around outside the rooms. The hotel is situated adjacent to a large square with park benches to relax on. We needed to print some flight information which cost us /sheet. Previous hotels had not charged us but happy to pay for the service. Very helpful frontdesk support. We had to shorten our stay due to altitude sickness and the front desk lady spent a lot of time calling the airlines to change our flights. Decent-sized rooms. Unique decorations. Good breakfast. Great location. Helpful staff. We asked for a balcony room, and got one with a private balcony (some are shared) overlooking the plaza. The bedroom was on a separate level above a little sitting room and the bathroom (with a bath) This plaza is only a block away from the main plaza, but is a bit quieter. The staff were helpful, giving tips on how much taxis cost and how to get around etc. We booked a few months in advance, and paid about half the advertised walk-in rate. There are a lot of stairs in this hotel, so if you have trouble climbing stairs it's probably not the best option for you. I would stay here again, and recommend it to others travelling to Cusco. I stayed three nights and very much enjoyed my time. I own a hotel and I am very ware of details and this hotel measured up. Near a main square where many attractions including restauratns are found. The room has only heating facility. The lack of proper air conditioning makes it difficult to sleep, particularly for our limited experience staying in a high-altitude looation. However, the central lcoation made up for some of these limitations. Friendly welcome from the staff. Nice rooms. Great view from the balcony. Excellent service from staff. The staff was very pleasant at check in. When ever I asked for anything I got it right away. The rooms were clean and the balcony was great. The breakfast restaurant was very nice. The location was excellent. Right across the street from a plaza. A two minute walk from the main Plaza in Cusco. Lots of restaurants near by. No noise at night. We used this hotel as our base during our stay in Cuzco so we checked in 4 times while we traveled between Cuzco/Puno/Puerto Maldonaldo and Machu Picchu. Airport pickup was easy and efficient. They were happy to store our luggage and would always make it available in the room before we checked in which was great. Rooms were basic but were clean and had all the basic amenities we required. Breakfast options were good, especially the omlette. The same review is going to appear 4 times here... We used this hotel as our base during our stay in Cuzco so we checked in 4 times while we traveled between Cuzco/Puno/Puerto Maldonaldo and Machu Picchu. Airport pickup was easy and efficient. They were happy to store our luggage and would always make it available in the room before we checked in which was great. Rooms were basic but were clean and had all the basic amenities we required. Breakfast options were good, especially the omlette. Cisco is perhaps the most beautiful part of the belváro located in the middle of the classic Spanish-style hotel in the Inca. The hotel is very unique with a different style, the rates were very reasonable and the rooms were large and comfy. The omlette station in the morning was the best part! We stayed at Royal Inca 2 HOtel for 2 nights and then to Royal Inca 1 this hotel was of a much better standard newere and arooms overall were of a much better standard. 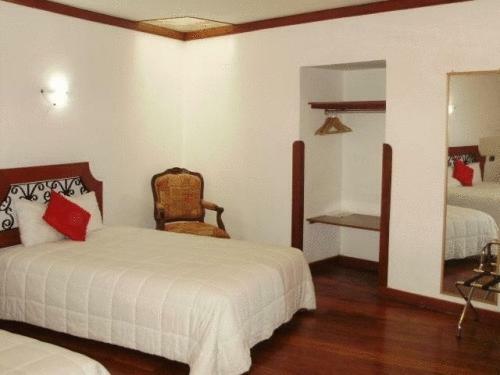 Hotel is in a greata location handy to many tourist attractions, plenty of good resturants.